The 100GBASE CFP modules offer customers 100 Gigabit Ethernet connectivity options for data center networking, enterprise core aggregation, and service provider transport applications. The 100GBASE-SR10 CFP module supports link lengths of 100 meters and 150 meters respectively on laser-optimized OM3 and OM4 multifiber cables. 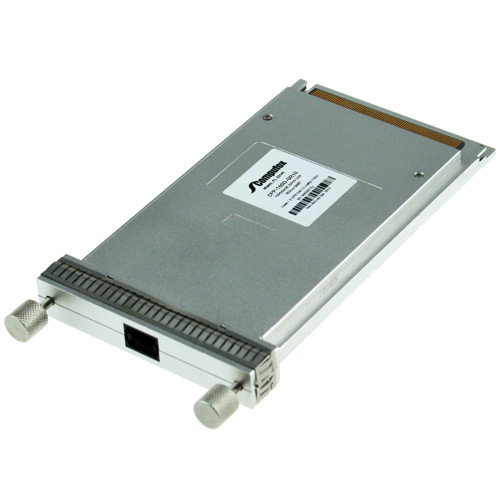 It primarily enables high-bandwidth 100-Gigabit links over 24-fiber ribbon cables terminated with MPO/MTP connectors. It can also be used in 10x10G mode along with ribbon to duplex fiber breakout cables for connectivity to ten 10GBASE-SR optical interfaces. Maximum channel insertion loss allowed is respectively 1.9dB over 100m of OM3 cable or 1.5dB over 150m of OM4 cable.